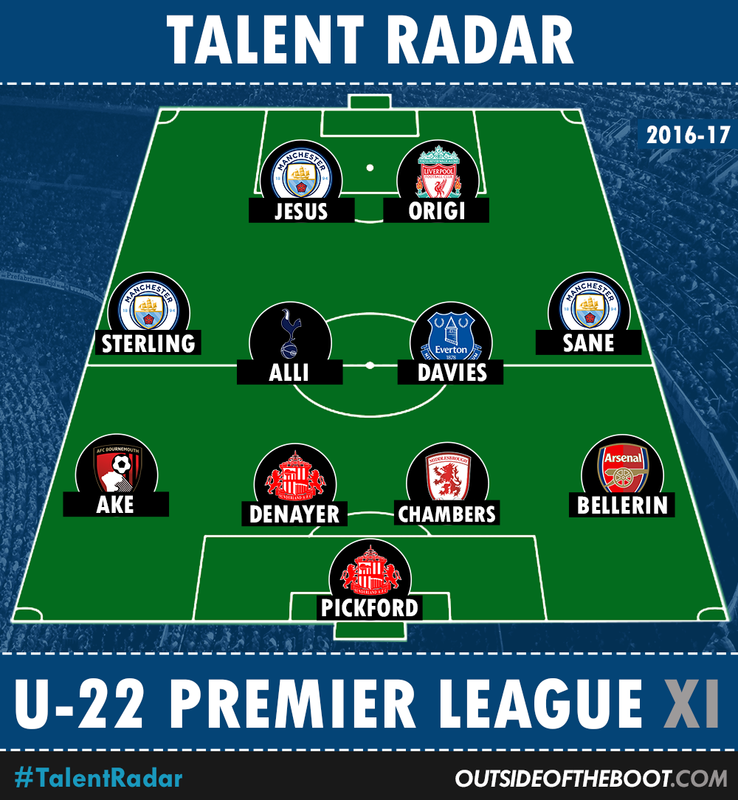 As the end of the season beckons across Europe, it is time for us at Outside of the Boot to recognize the accomplishments of tomorrow’s stars under our Talent Radar banner, with the U-22 Team of the Season across each individual top leagues being featured for the fourth consecutive year. This feature looks at the best of the Premier League. Jordan Pickford // 23 // Sunderland // Goalkeeper: Pickford might have played for the bottom side in the league in Sunderland, but that is no reflection on his abilities and hard work through the season. Sunderland’s last line of defence has been called upon very often, and he’s rarely disappointed. Surely, we’ll be seeing some more of Pickford in the Premier League next season. Hector Bellerin // 22 // Arsenal // Right Back: Bellerin seems to have settled nicely into the Arsenal mould now. The youngster started the season very well, followed it up with injuries and a decline in form, and finished on a strong note. The ultra attacking player has seen his development halted a tad this season, but considering that he’s still very young, he can take it as a learning curve. Calum Chambers // 22 // Middlesbrough // Centre Back: Chambers struggled at times last season, and was run very ragged in the first match of the season by Liverpool. Therefore, the loan move to Boro was a very wise option for him, and one that has worked out well. Chambers has been away from the glare of the limelight, and this has allowed him to improve with the playing time afforded to him. Boro may be relegated, but one must remember that this is not down to their defensive record, but rather their poor track record with scoring goals. Jason Denayer // 21 // Sunderland // Centre Back: Though Sunderland have been relegated, it doesn’t take away from the achievements of youngsters like Denayer and Pickford. The Belgian has been used by Moyes in midfield as well, but his better performances have come at centre back. He’s a good tackler, and a fair physical presence in defence, making him quite useful to his team’s cause. Nathan Ake // 22 // Bournemouth // Left Back: Another versatile player, young Ake started the season on loan at Bournemouth, and did a fantastic job for the Cherries. His steady tackling and simple passing made him a very effective defender to have. Ake was such a respected defender that he was called back to Chelsea by Antonio Conte in January. Playing time has been hard to come by for the youngster, but he hasn’t disappointed when given the opportunity, such as in the semi final against Spurs. Raheem Sterling // 22 // Manchester City // Right Winger: Guardiola has had a difficult introduction to the Premier League, but there is no disputing the improvement he has brought about in Sterling. The youngster has the most touches of any player in opposition areas, and his pace and skill seem to be accompanied by better positioning too. He still lacks consistency and the final product from time to time, but if he can show enough to keep Pep’s faith, he could turn into something special. Tom Davies // 18 // Everton // Central Midfielder: Davies has already endeared himself to Everton fans, by merit of being ‘one of their own’. That aside, he’s also been absolutely fantastic in the middle of the park, helping Koeman phase out someone like Gareth Barry. His passing and energy have been top class, and he’s also got a couple of good goals to his name. Dele Alli // 21 // Tottenham // Central Midfielder: Tottenham have improved their position in the league once again, finalizing 2nd place after a win over Manchester United this past weekend. Full credit to Pochettino for consistently improving players like Eriksen, Kane, Vertonghen, and of course, Dele. The young midfielder had a rough start to the season as Tottenham crashed out of the Champions League. But a switch to 3 at the back freed the youngster, and the goals and assists have flowed ever since. Dele has used his technique and skill, added it to his natural aggression, and given us a terrific goalscoring midfielder. Leroy Sane // 21 // Manchester City // Left Winger: The German had a slightly late start to the season, but he’s grown into one of City’s best and most important players with time. The pacy winger has formed a formidable front trio with Sterling and Gabriel Jesus. His movement and decision making have also come in for praise, and he should be a real prospect for next season. Divock Origi // 22 // Liverpool // Striker: The Merseysiders were cruising and in the title race till January, but injuries and the AFCON put paid to those hopes. Filling in for the various absentees at various times has been Divock Origi. The Belgian forward has shown Klopp that he’s a very willing worker, and his seven goals and three assists in the league could prove to be the difference between Champions League and Europa League.